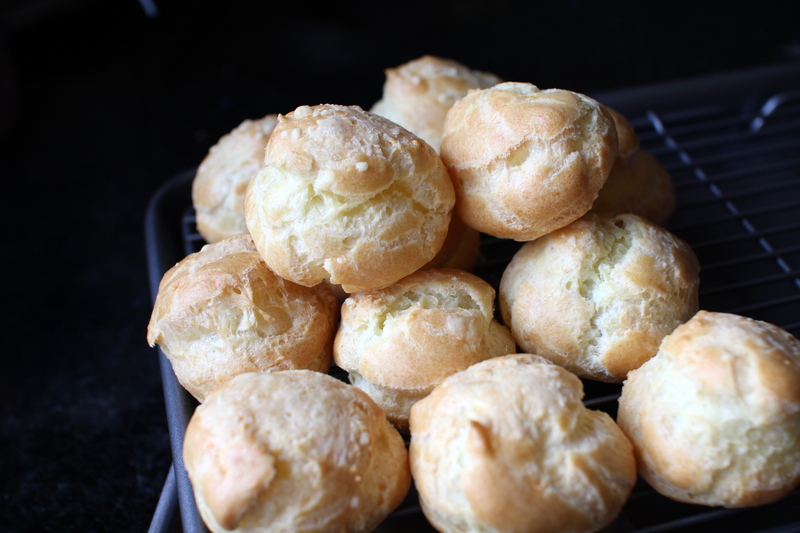 Pâte a Choux, two ways [recipe] – Cin Cin, Let's Eat! Cream puffs are one of my favorite desserts! A buttery and flaky shell filled with custard and jam, sometimes topped with chocolate… That’s perfection to me. But, it’s not something I ever thought about making at home. Growing up, I remember seeing those perfectly lined up swan cream puffs at fancy buffet’s dessert line (you know what I’m talking about) and watching elite French master pastry chefs making croquembouche on tv. All this gave me the illusion of the cream puffs being a highly technical and difficult dessert that can only be made by trained professionals. The ingredients are easy to remember too! it’s a 1:1:1:1 ratio, meaning – 1 cup of water (or milk), 1 stick of butter, 1 cup of flour, and 1 cup of eggs (~4 eggs). It’s so easy to whip up and put together, I’ve made several batches throughout the holidays, some savory (gougeres, with cheese) and some sweet. 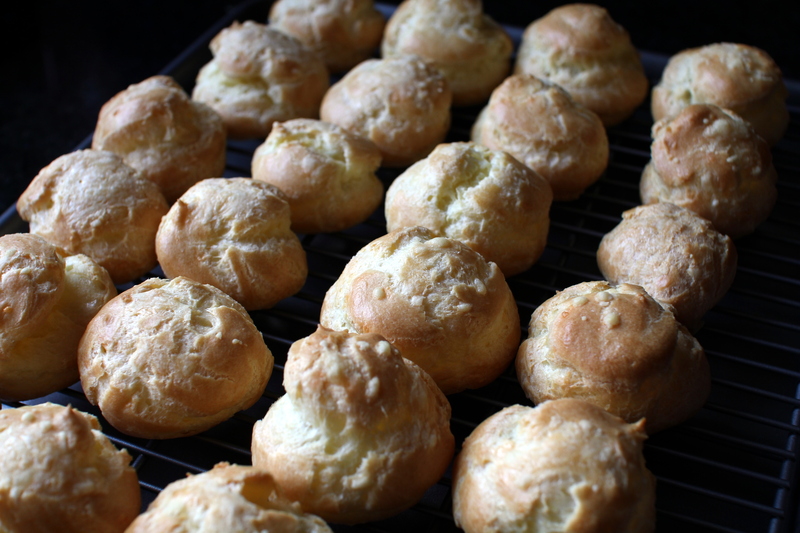 The following is a standard recipe for basic pâte a choux. To make gougeres, or any savory preparation, add two tablespoons of Parmigiano-Reggiano to the dough along with the eggs (top with more cheese to bake them in a hot oven for a half hour or so till cooked through). 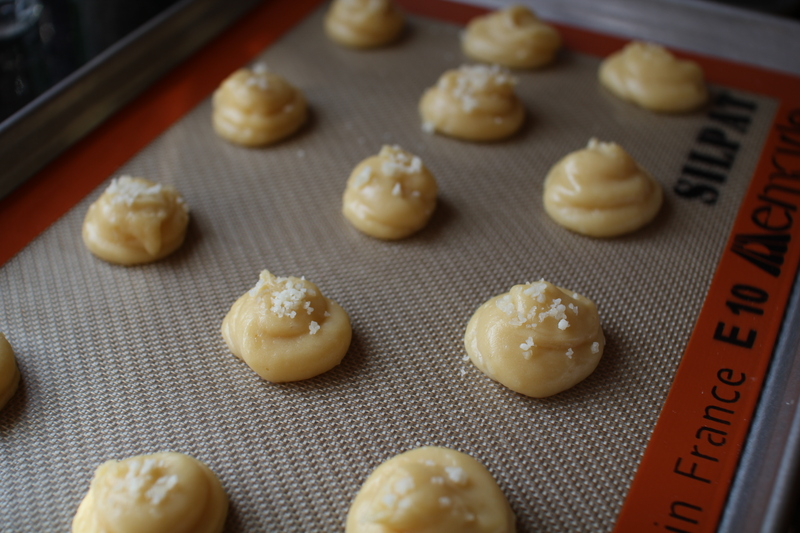 For a sweet choux dough, add two tablespoons of sugar to the milk and butter as you heat it. This recipe can be made all in the same pot using a stiff wood spoon, but it’s easier, and the dough puffs more, if you use a standing mixer with a paddle attachment or an electric hand mixer to beat in the eggs. 2. Add the eggs one at a time mixing rapidly until each is combined into the paste. The paste will go from shiny to furry, slippery to sticky as the egg is incorporated. The pâte a choux can be cooked immediately at this point or refrigerated for up to a day until ready to use. 3. Spoon or pipe it onto a baking sheet, (remember to press the peaks down with a moistened finger, they can burn) and bake in a hot oven (425 for 10 minutes, 350 for another half hour or so, is ideal) for cream puffs, profiteroles and gougeres. I generally used a disposable piping bag to pipe, but I find that the gallon-size ziploc bags are perfect for piping these. For savory gougeres, I added finely grated gruyere cheese to the batter as well as a sprinkle of it on the top prior to baking. I served these cheesy goodness with tapenade, onion jam, and a cheese platter. But they are delicious on their own. Make them smaller for a party’s bite-size appetizers, and make them bigger to replace those rolls on the dinner table. 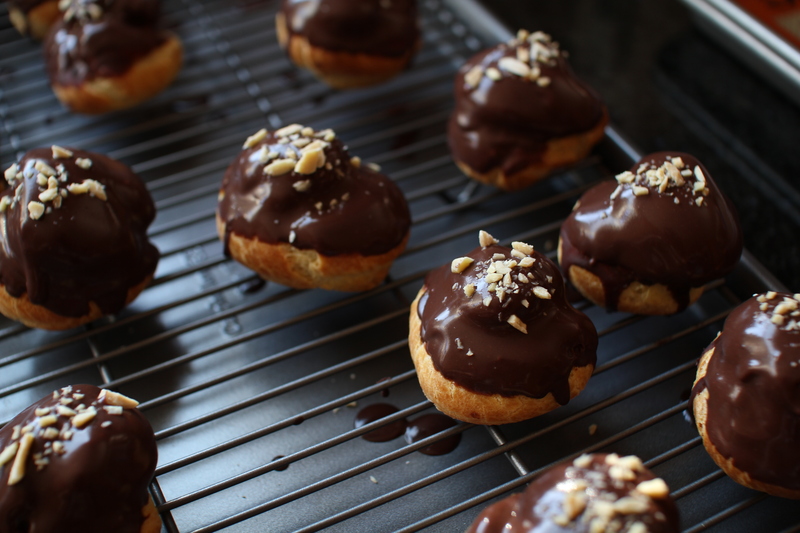 For sweet cream puffs or profiteroles, I made a simple pastry cream to fill inside the choux shells, then I dipped the top in melted dark chocolate, finished with some chopped toasted almonds and hazelnuts. You can fill the choux pastry with jam, or cut them open and put a scoop of ice cream in the middle. My wife is having fun with his Ratio book. We’ll have to give these a go. Had the best cream puffs with pimento cheese and bacon jam the other day. Have to try to copy at home. These all look great. Yum. That does sound easy and very similar to some Parmesan prosciutto sage puffs I made recently. Awesome! I love all the possibilities! Pingback: Pumpkin Gruyere Gourgeres [recipe] « Cin Cin, Let's Eat!